Every detail of the Onyx has been designed with the traveling executive in mind. Its top-of-the-line materials, premium features and timeless styling make this the right choice for discerning mobile professionals. Traveling executives will appreciate the expertly crafted construction, quality materials and intuitive design of the Onyx Backpack. 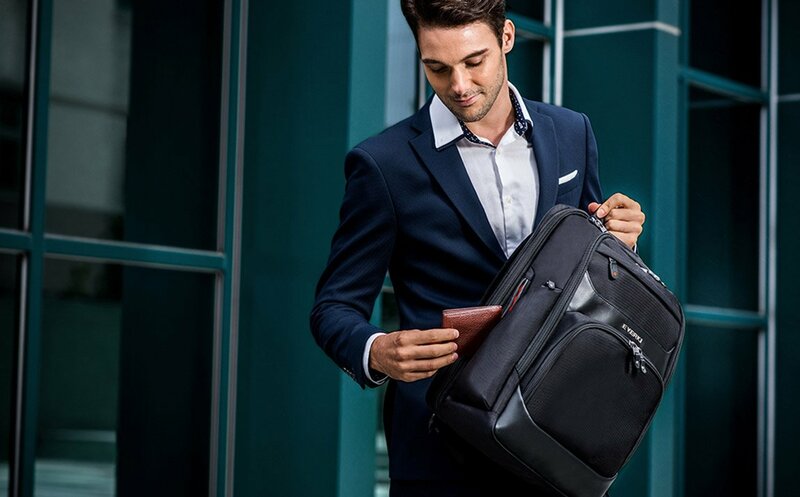 This smartly designed laptop bag features a dedicated compartment for your technology, an RFID-protected pocket for your important documents, along with the premium features you desire in a laptop backpack. Beautifully packaged in ballistic nylon with premium leather accents, the Onyx Backpack is the perfect bag for C-Suite executives. 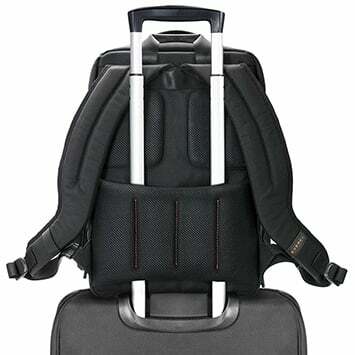 This executive backpack is designed with the style and features befitting the boardroom. 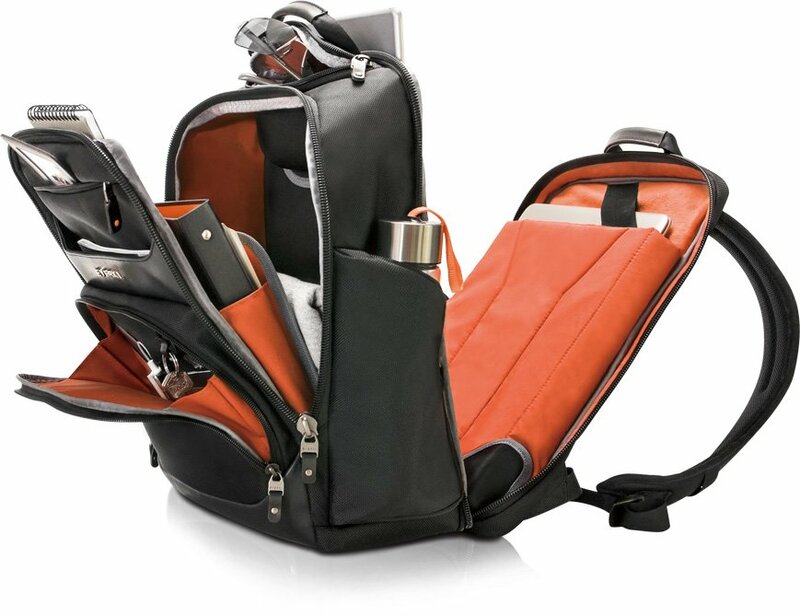 The Onyx provides maximum protection and intuitive organization for your technology and other necessities, wrapped up in top-of-the-line style. 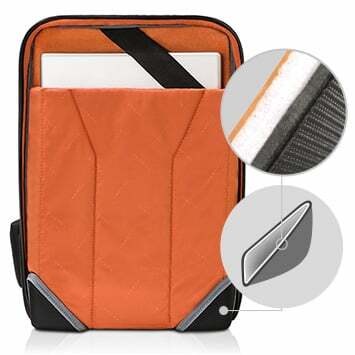 Your 15.6-inch laptop and tablet can be securely tucked away in their own individual felt-lined pockets found in the dedicated technology compartment, while sensitive items like passports and credit cards can be safely stored in the discreet RFID-protected pocket. More fragile items like sunglasses and mobile phones have their own spots in the hard-shell quick-access sunglasses case placed at the top of the bag. 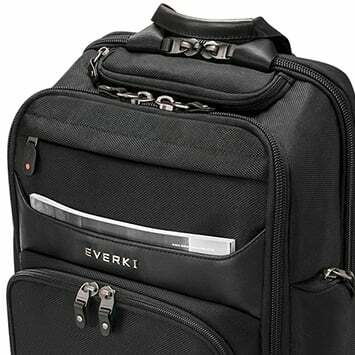 With these and the many other organizational pockets and compartments you’ll find throughout the bag, organizing for your business trip has never been easier. Going through airport security can be a hassle, so we designed the technology compartment in the Onyx to help you pass through security quickly and easily. 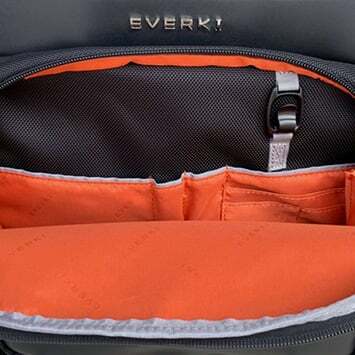 The dedicated compartment that stores both your laptop and tablet is immediately accessible, so if you have to remove your devices for screening, you can simply unzip the technology compartment and access them without rummaging through the rest of your bag. 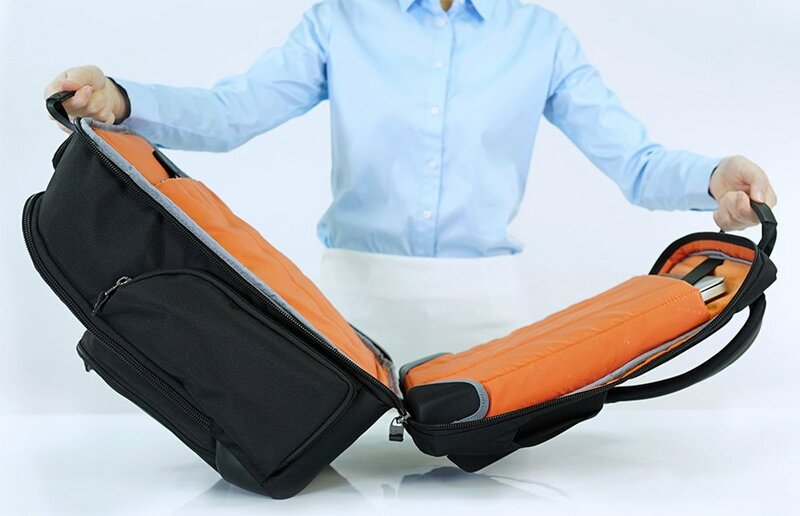 And if you happen to go through a security checkpoint that acknowledges Checkpoint Friendly bags, you can just open that compartment up 180 degrees, lay it flat, and let your bag quickly pass through the scanner. Most contemporary passports, credit cards and smart cards come equipped with an RFID micro-chip. Carrying them may make you vulnerable to illegal remote scans of the personal information stored on them. That’s why we designed the Onyx to protect your sensitive data with a discreetly placed RFID-protected pocket. Tucked away secretly on the side of the bag, you can access it without removing the backpack. 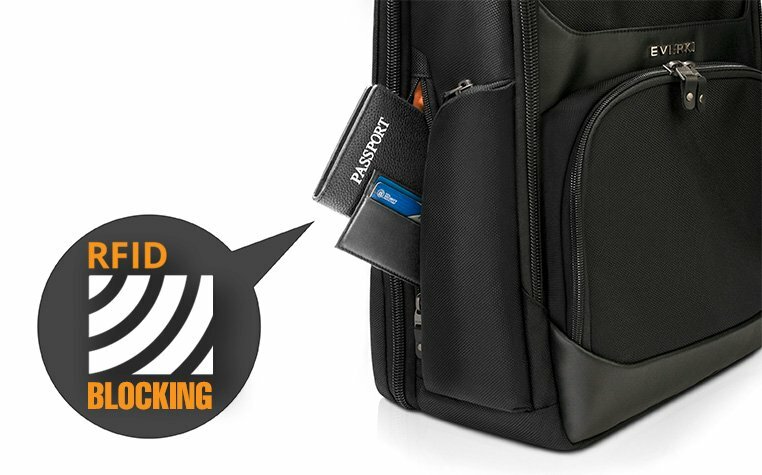 Simply swing the bag around on one shoulder, slip your passport, credit cards or other forms of identification into the secure pocket, and your personal and banking information are safe from spying eyes and illegal RFID scans. Our patented corner-guard protection system uses form-fitting corners to wrap snugly around the bottom of your laptop pocket to protect against knocks and bumps – or if you set your bag down too abruptly. 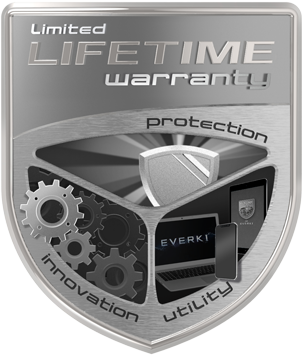 The shock-absorbing system gives you peace of mind, knowing your laptop is safe. We designed the Onyx with a quick-access magazine slot at the front of the backpack to easily slip your reading material right into the bag when boarding, and quickly retrieve it again when you’re seated. Thoughtful details make your travel more enjoyable. When traveling with many bags, the trolley handle pass-through on the back of the Onyx allows you to double your efforts. Simply slip the backpack onto the handle of your luggage and you’re ready to wheel through the airport.